What is a bin liner gauge? 100 gauge = 25 microns = Light Duty, economy black bin liner typically sold in discount stores. 120 gauge = 30 microns = Medium duty, this would be the standard bin liner. 140 gauge = 40 microns = Medium Duty, most popular thickness bag for refuse sacks. 160 gauge = 40 microns = Extra Medium Duty for General purpose, strong quality black bin liner for domestic use. 200 gauge = 50 microns = Heavy duty bag, suitable for commercial waste. 300 gauge = 75 microns = Extra Heavy duty, ideal for building & garden waste. 500 gauge = 125 microns = Normally a rubble sack for building waste. Regardless of the thickness of the bag, sharp objects such as glass and metal will puncture or tear most bags. Thin bags will tear of puncture by pure weight, however thicker bags will not tear easily without first being torn or punctured. Some bags will be made from medium or high density polythene. This most certainly makes them more crinkly (like the typical supermarket bags you will find) and can be made thinner for the same strength. Why would you have a clear liner over black? You will see by the pricing that for the exact same size, thickness & strength bag that the colour black would be cheaper than the clear, so with this in mind as you can imagine we find that black bags are by far the most popular. The clear bags are best used for segregating waste, because you can visually see what waste is inside the bag. Why do prices state, “from” a given price? The prices quoted on the items on our website are the cheapest price offered when you order in bulk, and follow a tiered structure. We therefore reward you for placing bigger orders with us by offering you discounted prices. If you click on the item you would like to order, a small table presents the price we offer for the quantity ranges you desire. What are the differences between pedal, square and swing bin liners? These bin liners are designed to best fit a bin of their desired category. Square bins being the standard open bins, swing bins generally consisting of a swinging or sliding hatch through which rubbish is placed, and pedal bins for those opened with a foot lever. Our pedal bin liners are typically a lot smaller than their counterparts. What do the bin liner measurements indicate? 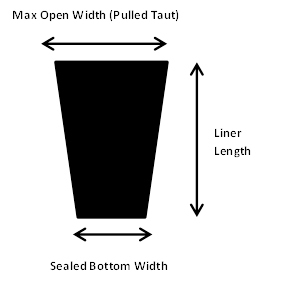 The first measurement given to our bin liners is the sealed closed width of the bottom of the liner, which sits at the bottom of the bin.The second measurement given is the maximum open width of the liner. This is when the bag is opened, and stretched taut from one side to the other. Please note this is not the circumference! The third measurement is the length of the liner. This is simply measured from top to bottom. For example, an 18x29x39 liner would be a liner with a sealed bottom width of 18 inches, a top maximum open width of 29 inches, and a length of 39 inches. I need metric measurements, how can I convert to this from imperial measurements? Most measurements are given in imperial units (inches and gauge), but you may want to convert this into metric, or vice versa. For example: A 4"x 6" x 150 gauge bag is the same as a 10.16cm x 15. 24cm x 37.5 micron bag. I can’t remember what liners I ordered with you last time? We have a large database with records of all previous orders that have been placed. We can therefore search through any previous orders you have placed with us, take a look at the unique product code, and organise a re-order of that same product quickly and efficiently. How can you prove your bin liners are biodegradable? At BinLinersDirect, we pride ourselves on meeting the necessary European requirements. Our entire range of biodegradable bin liners have been rigorously tested, and degrade safely and naturally. Our certificates page (found at the bottom of the home page) shows you the variety of different marks on our liners to prove they are genuine quality. All of our biodegradable liners are fully compostable. Where are your bin liners manufactured? The majority of our bin liners are manufactured in the UK. This ensures that the quality of our products is second to none, and come from an extremely reliable source. This means that we only provide the best possible service to our valuable customers. The first measurement given to our bin liners is the sealed closed width of the bottom of the liner, which sits at the bottom of the bin.The second measurement given is the maximum open width of the liner. This is when the bag is opened, and stretched taut from one side to the other. Please note this is not the circumference!The third measurement is the length of the liner. This is simply measured from top to bottom.